There has been a gory accident just at the spot where the late Ebony died. The accident occurred at Akwatiakrom in the Ahafo Ano South District of the Ashanti region, the exact spot where the late Ebony Reigns was killed. 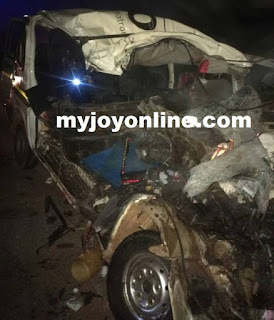 A Ford minibus, travelling from Sunyani in the Brong Ahafo region to Kumasi in the Ashanti regional capital collided head-on with a cargo truck travelling from Mankraso. Police officials blame the accident on poor weather. According to reports by Myjoyonline, the crash left 11 dead males, including the driver of the Ford minibus and a female. 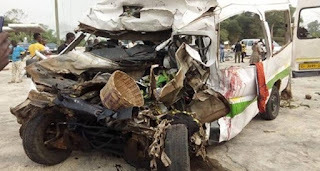 The 15-seater minibus, with registration AS 7257-15 veered off its lane onto that of the cargo truck with registration GR 2624-14 travelling from Kumasi to Dormaa Ahenkro to load cashew. Three people, including the driver of the Benz cargo truck who survived the accident, are currently on admission at the Bechem Government Hospital. It took Fire Service several minutes to arrive at the scene from Sunyani after police from Mankraso were called to help convey both the injured and dead to the hospital as well as manage traffic. This is the second time in three months that fatal accident has been recorded on that stretch.